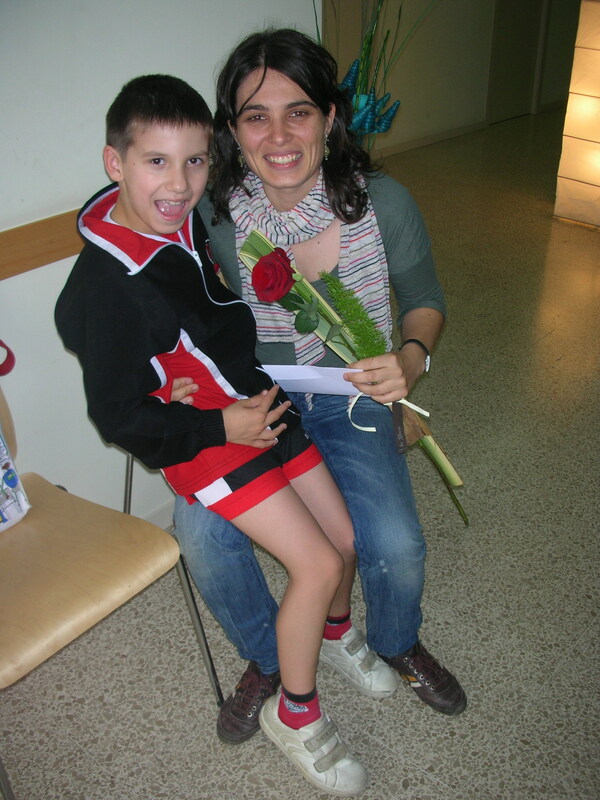 My name is Montse Vilà and I am the special education teacher of an ordinary school in Igualada, in Anoia region. The first year I worked with Àlex was in the school year 2010-2011. 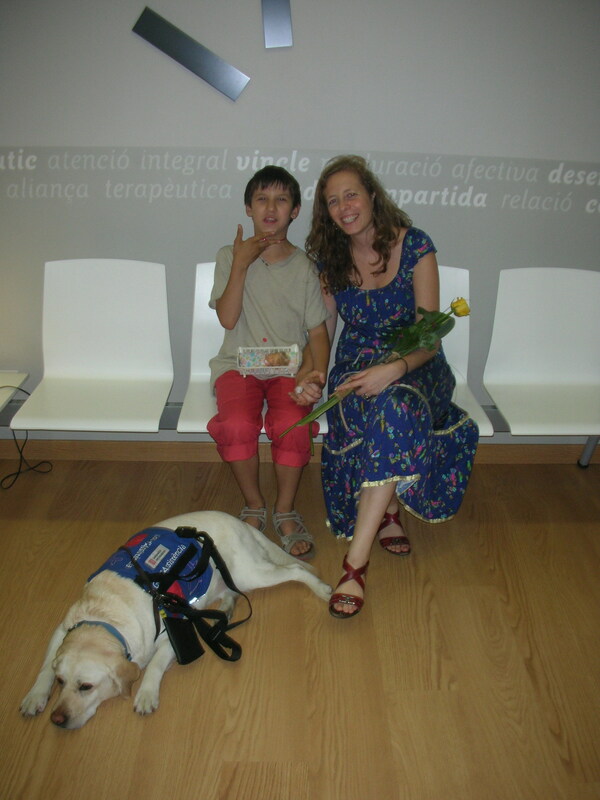 From the start, Àlex showed interest and was happy to come to special education classes. Although not the environment, the teacher was different from the one he knew. We thought this change might cause him an upheaval, but the adaptation was really fast and pleasant. Àlex attended class every day with a new “conflict-obsession”. Often, we took advantage of the topic of his interest to start the daily time dedicated to oral expression, and then, we would refocus the issue to the subject we were interested to talk about that day. Gradually, and after a whole year, those daily obsessions got gradually reduced as he became more self-confident and learned to overcome those fears and insecurities that used to dominate him. With Àlex, as with other people with Autism Spectrum Disorder, is very important at the beginning of each class or before starting any activity, to explain him what we are going to do and in which order we have it planned, because this routine gives him security and there are no surprises he feels he can not control. Àlex’s school work starts with a routine that soon he made himself: date (day, month and year), weather (relating it to the season) and the school schedule for that day. At that time, Àlex attended second year of Elementary School. He used to go to the swimming-pool with the rest of the class and he used to participate in the school activities: theater, trips, camps, traditional events… Àlex is very integrated with the other children in the school. Àlex is affectionate and polite. He has achieved the habits of personal independence and hygiene; he is organized and methodical when arranging his materials and belongings. He is able to express his feelings and moods quite clearly. Before, it would have been unthinkable that he could tell you what was wrong with him without an adult helping him express it. He shows independence when moving around the school and he is more sociable than anybody could expect. However, it should be mentioned here that Àlex’s current situation comes largely from the efforts and dedication firstly of his parents and secondly of all the professionals working with him from their own specialities. Àlex’s personal progress would not go forward if these treatments -therapeutic therapies- he is working on nowadays would not continue. Àlex, I really want you to keep being the “little person” so special as you have been for me since I have known you. I am writing to you today to talk about Àlex. I worked with him in Carrilet Attention Service for two years since September 2010. Àlex is curious, restless and observant, a very sensitive and affectionate child. He has been diagnosed with Autism Spectrum Disorder. Àlex doesn’t perceive the world the same way as the majority of people do; his life is often disturbing and disconcerting. This results in him frequently wondering about the reason for many things; for example, the whys of people’s responses, their motives, and he usually asks repeatedly: “and why?”. He has difficulty anticipating others actions as his ability to put himself in someone else’s place is limited. This means that his world is unpredictable and consequently he gets deeply distressed. Let’s try to put ourselves in his place. Imagine we could not translate the meaning of a traffic light; so therefore, whenever we wanted to cross a busy avenue we would feel frightened as we would not know the car’s movement, if they would stop or go on. In short, we would not be sure if we were safe or in danger. Àlex’s life is a bit like this. Luckily, Àlex has received help from professionals which has been assumed by his parents with hard work, perseverance and dedication. As they say “it is his future” and yes, this is the main fear for many families. “What will happen to Àlex when we are no longer here?” they wonder. The relational psychotherapeutic work is based on taking care of his emotional well-being and of his psychological and human development, making possible everyday functions as optimal and independent as possible. We must help him take responsibility for his things, help him learn, help him manage his emotions and help him understand the world. I have been lucky to meet Àlex. We have done a bit of his journey together, during which we have got angry, we have had good times, we have cried and we have seen inside each other. We have been able to talk about his fears, about his discomfort, about the things he does not understand. Now, Àlex is more capable to regulate himself, to express his emotions, to organize his time, and he can also establish bonds. Now, he is on another stage and it is essential to continue working. From here, I want to join his family in asking for financial support so that Àlex can continue his path as happily as possible. I met Àlex Gómez Máximo in October 2008 when I was working at “Attention Service Carrilet (ASC)” carrying out treatments as a psychologist for children with Autism Spectrum Disorder (ASD). Àlex and his family were looking for a entity that could explain to them what was wrong with their son and help them understand and take charge of the difficulties their child had. I did the diagnostic process which confirmed that Àlex was a child with Autism Spectrum Disorder (ASD), and once the therapeutic objectives were explained to his parents, we started the weekly treatments. The process carried out with Àlex was complex; the work was done together with the family and the ordinary school, always moving forward jointly and coordinated. We were all very involved so that Àlex could have a better quality of life and would develop the necessary skills in order to communicate, interact and express himself in a better way, being connected to his environment. The evolution during the treatment was very good. Individually, Àlex started learning how to regulate himself, to understand and communicate, to express his love and needs, to feel loved and to love in a more peaceful and safer way. He started being more self-confident and feeling capable to grow up, to do every day more things that made him feel happy. With his family we started to work their personal process as Àlex’s parents, to understand the difficulties and to learn how to join and contain their child in suffering. Finally, we coordinated and monitored with the ordinary school to ensure that Àlex’s school environment was the best. This task was done in a more specific way by another psychologist of this service who also cooperated in the monthly follow-up with the family. It should be pointed out that Àlex started with a medication treatment in order to help him regulate his disruptive behaviour which interfered in the psychotherapic treatment, in the relationship with his parents and in the school. From the beginning of the pharmacological treatment these behaviours became more contained making the process development easier and more positive. This task was done by a psychiatrist from this service carrying out a psychiatric and pharmacological monitoring of Àlex and counselling with his parents on a regular basis. My part in the treatment came to an end in July 2010, when due to employment issues I stopped working at “Attention Service Carrilet (ASC)”. The farewell was quite, serene but with pity and longing. From then on, Àlex was attended by another psychologist of this service as the necessity to continue working with him was reinforced, because of the difficulties he still had, but also because of the positive development he was doing and the great amount of resources he was getting capable to display. There was still a lot of work to do, taking advantage that Àlex was profiting from a psychotherapy space. And so it was done. When I think about Àlex’s story, his origins, his encounter with those that would be his parents, his internal journey, the impacts he suffered in the first months of his life… I feel that he is a fighter, that he is very brave. I believe he will accomplish anything because he deserves it and his parents too. I remember how they came every week to work with me; they came committed, confident and grateful. They have had this attitude until now and they must continue like this. Excitement, hope, confidence and belief are essential props for Àlex’s good development. Children with Autism Spectrum Disorder (ASD), the sooner they are treated the better is the prognosis. And the end of the treatment does not have a specific objective. Parents’ expectations regarding the improvement in their son’s quality of life has neither limits nor end. Àlex’s parents have always struggled to know, learn and give their son everything that was good for his development. They keep doing so. Àlex has changed a lot since I met him and he needs to change even more, he needs support. Space, treatment and therapy must be offered to him to continue encouraging his resources and abilities. It would be unfair if it is not so. For this reason, the family told me about the difficulties they were having to carry on with the treatments as before. Together with all the professionals who have taken part in the care and treatment of this child, I decided to write this document. I wish it would serve as a witness, a call of protest, to find and gather the necessary support to help them go on, and we could feel happy that it was worthy, because fighting is always worthy. As a psychologist and psychotherapist I ensure that it is very important for Àlex and his family to have the necessary resources in order to continue working and treating the difficulties that Àlex suffers as a consequence of Autism Spectrum Disorder (ASD). Close your eyes and imagine a huge box full of crayons of different colours… from white to black, with all the different tones and textures… This is the world of Autism Spectrum Disorder (ASD), with all its variety and differences. Autism is a development disorder that appears from childhood. Its characteristics are: impaired social interaction, difficulties in verbal and nonverbal communication and restricted and repetitive interests and activities. About 3 to 5 children out of 10,000 are autistic. Boys are affected 3 to 4 times more than girls but often autism is more severe in girls than in boys. Autism is more than a problem affecting one individual; it is a disability disorder that affects the whole family. The treatment needed for children with autism is very demanding for the family, both, emotionally and economically. Parents of children with autism are exposed to multiple challenges that have a hard impact in their most direct environment. There is no cure for autism, but therapies and conductual interventions are designed to improve the main symptoms of autism and may allow a substantial improvement. All professionals agree on the fact that the sooner intervention takes place the better. The family counselling for parents and siblings of children with autism (as well as in school) is as important as the treatment given to the children affected by this disorder. The fact that a child has autism, does not mean that he or she is autistic. In the same way that a person who suffers a bipolar disorder does not mean that she or he is bipolar. What I mean to say is that they are children like the rest of children. They want to smile, share and to be understood. Any child can learn. What we need to do is to find the right way to teach them. That is our job and it is every professional’s goal. We have to fight for these children to have a good quality of life with their families and all people around them, for them to be happy.